The family of Rotary in the BVI and the wider Caribbean have lost one of their stalwarts. Elton Georges, who joined the Rotary Club of Tortola in the seventies, served as President from 1999-2000. During his tenure in office he was instrumental in convincing his fellow Rotarians to accept ladies into the club. His effort was crowned, when at the installation Dinner in July 2000 Delma Maduro was the first female inducted in the club. It is because of past president Elton’s efforts that the club can pride itself to have the first District Governor coming from their club and only the second female District Governor for the northern Caribbean District as Rotarian Delma will be sworn in as District Governor for District 7020 at the District Convention 2019 in Jamaica. PP Elton’s achievement in Rotary and community service in the BVI could fill books. They were summarized at the weekly Rotary luncheon by Past Assistant Governor Rotarian Gerard StC Farara, QC, PHF, as the Rotarians paid tribute to their beloved PP Elton Georges. “As members of the community of the people in the British Virgin Islands, we come to whatever we are doing today with a very heavy heart indeed. This is because, as we know, of the passing of our dear brother and Rotarian Elton Georges. Elton is one of those sons of the soil who has made an indelible mark and impression on the history of the British Virgin Islands, and he has done so over a long and distinguished career of public and community service in his homeland of the British Virgin Islands. Elton is one of those sons of the soil who availed himself, in the very formative years of his life, of educational opportunities that were being offered here in the BVI. He is certainly one who distinguished himself as a student, to the extent whereby he went on to tertiary and higher education, and distinguished himself at that level in studies, both at the undergraduate and graduate level, in Canada at certain distinguished universities and halls of learning. When I think of Past President Elton in that context, I also immediately think of someone like Elihu Rhymer who was also a member of this club; who, in many respects, his life and dedication to this country has paralleled that of Elton. Of course, they were great friends and that is of great importance as well. How does one really encapsulate the life and service of Past President Elton? 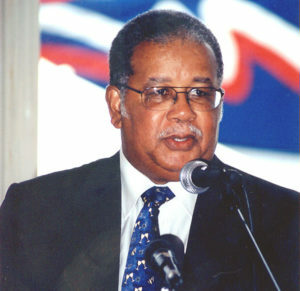 He was someone who clearly recognised his true calling in these British Virgin Islands was that of public service and indeed he had a distinguished career stretching most of his 75 years, rising to the highest echelons including that of Deputy Governor of the British Virgin Islands, a position which he held longer than anyone has held that particular position in the history of the BVI. Perhaps our own David Archer might eventually attain that long and distinguished career as Deputy Governor. He is off to a good start, and has a long way to go, but in saying that, of course, David has someone in Elton who he can emulate and follow. Elton was a learned person, Elton was a scholar. Elton was a historian, both of local and world history. He was an avid and ferocious reader, who did not recognise that his mental ability was in any way limited by the smallness of the country from which he was born and emanated. Elton was really a scholar among scholars anywhere in the world. That was exemplified in many ways during his career as a public servant, and indeed his tenure as a Rotarian and member of the Rotary Club of Tortola. That intellect that scholarly aptitude was most constantly on display, and it was rooted well and safely in his tenure as a teacher. I don’t think the teacher in him ever left, for he availed himself of every opportunity to correct us, including myself, with our grammar and diction and punctuation. Elton was one of those persons who not only understood but studied the English language, who knew how to use the English language appropriately and fittingly, having regard for whatever it is that he was speaking to. He was also someone who wrote very well, so his written word was equally as good and as powerful as his spoken word, and that is something which is a lesson to, I wouldn’t even want to say those of us who are present because we are somewhat advanced in age and perhaps very set in our ways and in what we do, but it is a sterling example that ought to be exemplified and followed by our young students in our various schools within this community, and indeed, the H. Lavity Stoutt Community College. You see, in the British Virgin Islands, we are called upon because of the kind of country that we have and its achievements over the last 25 to 30 years, to, as some people say, punch above our weight; and to do so requires persons of the calibre of Elton Georges to dedicate themselves to the public task of making the country what it could be and ought to be, and that is what has distinguished his career in the Public Service. Elton was someone who acquainted himself with the various subject matters in a deep and profound way, including constitutional issues. He was a student of constitutional law, even though not himself a lawyer. He was one who was very steeped and versed in matters relation to the deeming provisions concerning belongership and residency in the Territory, and he was one who had a great working knowledge of the British Nationality Act and was not afraid to challenge anyone, including lawyers, on what is the correct interpretation of particular provisions of that statute or the Constitution. I have experienced many a exchange by email and otherwise from PP Elton on a range of constitutional and legal issues affecting the country. If there was a particular article relating to a development or some learning elsewhere, whether it be in the Turks & Caicos Islands, Cayman Islands, United Kingdom or even further afield, that was germane to constitutional and legal issues of the country, Elton was sure to not only find it, but to circulate it to some of us for our input and comment. He was not afraid to give his advice, and to give it fearlessly and frankly, regardless of where it sat with anyone. If it meant it was not permissible, he said it, and I think this is one of the hallmarks of Elton that led to him becoming the first Complaints Commissioner of the British Virgin Islands. We could not have selected a better person from within our ranks to occupy that position, to be the first one to do so, and to launch that very important function of Ombudsman, with the kind of role it plays and ought to play in this community. And of course Elton even tried his hand in the private sector, he was a banker. Some people may not recall that, but at a particular point he retired from the Public Service and he became, if I remember correctly, the General Manager of First Pennsylvania Bank as the successor to Past Assistant Governor Audley Maduro. I think, however, unlike Audley who clearly was drawn to the private sector, it didn’t take Elton too long to recognise that he ought to find his way back to the Public Sector, which he did, and continued in the senior administrative position of Deputy Governor of the Territory where he served with great distinction. More recently he was appointed a director of Seven Seas Water, the local branch of the company that took over from Biwater, who have the facilities and contract to provide water within the Territory. I said before that Elton was a teacher, and I think that’s how he started his career. He was, for a very short time, my teacher when I was at Secondary School in Form 1. He taught me Spanish, and I believe he also taught Mathematics, but not to me. That may be why I learnt maths so well. I didn’t learn my Spanish very well, I must say I didn’t have any aptitude for foreign languages and still don’t. Strangely enough, we the students thought that Elton was less than inspiring as a teacher of Spanish, but he did teach was taught correctly, and the little Spanish that any of us picked up from him would have served us well in our succeeding years. I’m sure there are others who learned a lot more than I did. Of course after that he made his way into Public Service. Elton, as we know, was a deeply religious person. He was a Methodist all his life, and he became what we call a ‘local preacher’ or lay preacher. He revelled, if I may say so, in that office and in that position. I could see, in the little interaction I had with him in that aspect, that he prepared his sermons with great enthusiasm, and I’m sure, he delivered them with enthusiasm to the congregation. He also became the Chairman of the Health & Wellness Advisory Council and, as we are all familiar with, the President of the Diabetes Association. We all remember, perhaps not fondly for some of us, the ‘Loose to Win’ program in this club that was spearheaded by Elton for many years. Elton had the knack of losing just enough pounds to make some money out of us, and in short order, putting them back on. I think he recognised very early that the longevity of the program rested squarely on his shoulders, and it could not succeed if come the next year he was looking too slim and trim, there would be nothing left to take off. So he did a marvellous job and that program ran for many years. Elton was, of course, a very dedicated family man and today we must join with his wife Rita, his daughter Noni and his son Kamau in the grief that they are feeling with his passing, and we, as his brethren (and sisteren) in Rotary, must be there to be supportive of them in the weeks, months and years to come. As a Rotarian Elton was, in a somewhat subdued way, one of our most keen Rotarians. I say ‘somewhat’, because I don’t think he bounced in here every week to our regular meetings with great joy and enthusiasm exuding from him, but he was a very keen Rotarian, who looked forward to these meetings. In fact, he took serious objection to any president who decided to cancel the weekly meeting for any reason. It was in his blood, it was an innate compulsion to come to these meetings and to fellowship with his follow Rotarians. Of course, we know that he was one of our prolific questioners of guest speakers. He was also a Rotarian, a Past President, and who, in many respects was the pillar for finding us guest speakers on a weekly basis. Even when it was not his turn, it was not his duty for the month, you would often get an email from Elton suggesting a guest speaker or speakers for a particular week or even for the rest of the month, thereby making the task that was assigned to you the individual Rotarian far easier. In his presidency he served with great distinction and indeed is one of those persons who was very instrumental in ensuring that the halls of this club were open to women, and for that he will go down in the annals of Rotary, in this our 50th year, for the tremendous contribution that he made in that regard, and the kind of transformative effect that step has had on this club and, indeed, on Rotary in the wider sense within the British Virgin Islands. So today, even though, as I started out by saying, our hearts are heavy, and it is heavy for Elton to a great extent, but it is also heavy for Edwin (Speedy) George, who passed away recently. It is heavy for Ira Smith who also just passed away, and there are others going back. It seems that the effects of the hurricane period continues to take its toll on our people and our community, and we must be reminded as Rotarians that it is important for us to help to lead the way out of this devastation and dilemma that has been presented to us by the devastating hurricanes and flood. Indeed this club, these Rotarians, and our fellow Rotarians in the Territory, have lead from the very beginning. Elton was proud to be a part of that. That must be part of what encourages us to go forward, to do as much good, and to touch as many lives within our own community, within our country, and in the wider world, as we can and we ought to do as Rotarians. This tribute was followed by tributes of a number of his fellow Rotarians who remembered stories, events and anecdotes. Elton will be dearly missed by all. May his soul rest in eternal peace.